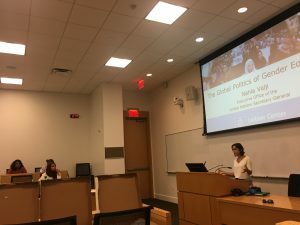 The Leitner Center was pleased to welcome Nahla Valji, Senior Gender Adviser in the UN Executive Office of the Secretary-General, as a speaker in the Leitner Human Rights Speaker Series. 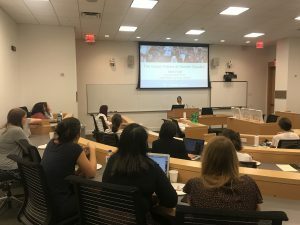 Ms. Valji examined global trends in gender inequality and focused on the United Nations’ own record of meeting gender parity goals in laying out Secretary-General Guterres’ Strategy. She discussed the critical role for temporary special measures to increase the meaningful representation and participation of women throughout the UN and in the UN’s humanitarian efforts and peace and security processes in particular. Ms. Valji’s talk also emphasized that prioritizing gender equality in post-conflict processes can also help to shift power dynamics and integrate historically marginalized perspectives, thereby strengthening peace agreements. Nahla Valji is the Senior Gender Adviser in the United Nations’ Executive Office of the Secretary-General (EOSG). Her primary functions currently are to set up and oversee the new UN-EU Spotlight Initiative to Eliminate Violence against Women and Girls, a 500m Euro fund in support of the Sustainable Development Goals and gender equality; as well as the Secretary-General’s Gender Parity Strategy among other efforts. She joined the Transition Team of then Secretary-General-designate Guterres in November 2016. Prior to this she was the Acting Chief/ Deputy Chief of the Peace and Security section in UN Women’s headquarters in New York, where she led for some years the organization’s work on peacekeeping, peace negotiations, transitional justice, and rule of law, involving both global programming and policy work, particularly with regards to the Security Council. In 2015, she headed the Secretariat for the Global Study on implementation of resolution 1325, a comprehensive study requested by the Security Council for the 15-year review of women, peace and security. She founded and managed the International Journal of Transitional Justice and is the co-editor of the Oxford Handbook on Gender and Conflict (2018). 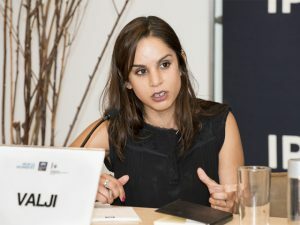 Prior to joining the UN, Nahla worked in South Africa, where she led the regional transitional justice work of the Centre for the Study of Violence and Reconciliation and managed the African Transitional Justice Research Network.